Footage of an extrajudicial killing of a young man reportedly shot multiple times by police has caused outrage in Kenya, sparking an investigation into the shooting. 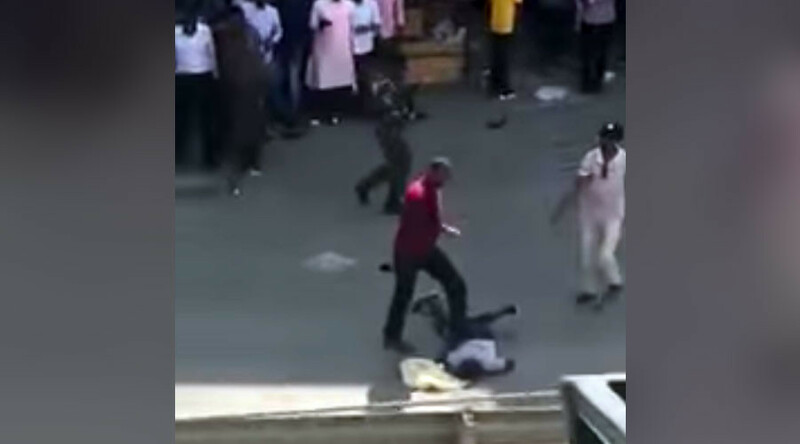 The video shows an undercover police officer shooting at two young man on a busy street in Nairobi’s Eastleigh on Friday. One of the men was killed in the incident. The footage is taken from a nearby balcony. An officer, dressed in a maroon polo shirt, is seen grabbing a young man as a crowd watches. Another man is lying bleeding on the ground next to them. The officer shoots the gun six times as the camera cuts to the balcony from where the woman is filming. She can be heard screaming over the gunfire. When the camera pans back to the street, the man is on the ground and the officer is pinning him down with his foot, as another man in a striped shirt passes him a new gun and takes the original one. The man aims his gun at the man on the ground and five gunshots ring out as the camera shakes. The man appears to reload his gun before returning to his victim - who is still moving - to fire another bullet in his back. According to local media, the dead men are believed to have belonged to the Gaza or Superpower gangs notorious for robberies and killings in the area. Police had reportedly been chasing the two men before the shooting took place. Another video shows the scene from a closer vantage point, and appears to have been taken just before the above footage was captured. It shows the other man lying on the ground and the officers and the victim arguing. The man in maroon is seen punching the boy, who then puts his hands up in surrender. The officers remove a weapon from his trousers. Inspector General of Police Joseph Boinnet condemned the violence and ordered a probe into the incident and the officers involved in the act. To some, the killings were warranted given the violence reportedly committed by the gangs. @ahmednasirlaw@UKenyatta@HonAdenDuale@WehliyeMohamed@makaumutua These are the gangs that kill to rob you and have made life in Eastleigh difficult. According to Tujo.co.ke, the officers were part of Pangani 9 branch of special police and were looking for gang members who killed a fellow police officer in Kayole. PANGANI 9 special police squad shoot dead a wanted armed mpesa serial thief in Kamkunji. A stray bullet also killed a dog. Police commander Japheth Koome, who originally claimed the video was “not true, it was acted,” said the suspect was wanted for killing two police officers.